At a City Council Transportation Committee hearing today, the New York Police Department announced its opposition to legislation that would curb parking placard abuse by requiring barcodes on official placards. NYPD claimed that it has placard abuse under control and that only Police Commissioner Ray Kelly should have the power to determine what tools are used to defend against it. Testimony from NYPD and DOT also revealed that there are currently 118,000 official placards in circulation, tens of thousands more than previously realized. Putting barcodes on placards would allow traffic enforcement agents to easily and accurately know whether the laminated plastic sitting on a car’s dashboard legitimately grants extra parking privileges. 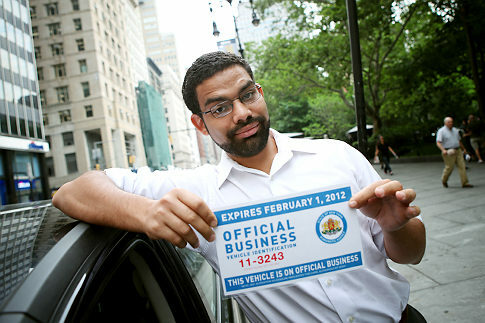 That wouldn’t solve every kind of placard abuse, but it would empower agents to ticket the truly bogus placards. Council Member Dan Garodnick, the bill’s sponsor, cited yesterday’s experiment by Transportation Alternatives, in which a placard from the “New York State Numismatic Agency,” marked with the official seal of Bulgaria, escaped ticketing during seven hours of illegal parking in Lower Manhattan, Downtown Brooklyn and Times Square, proving that placard enforcement was effectively non-existent. “It’s clearly time for the city to take a bolder step,” said Garodnick. The only person who didn’t see the need for action on placard abuse was Susan Petito, the assistant commissioner for intergovernmental affairs at NYPD. While Petito gave lip service to the council’s concern, she ultimately claimed that the NYPD had the problem under control. Petito and DOT Deputy Commissioner David Woloch revealed that there are currently far more official placards in circulation than previously announced. In its April report on placard abuse, Transportation Alternatives cited 78,000 as the official placard total. But between NYPD and DOT-issued placards, the total has crept back up to 118,000, Petito and Woloch testified. Much of the progress made by the Bloomberg administration to reduce the number of placards has been eroded. Petito also put forward a constantly shifting set of rationales rejecting the addition of barcodes to parking placards. First she claimed that NYPD’s equipment couldn’t scan though the windshield onto the dashboard. When Van Bramer suggested turning placards into stickers, Petito moved on to suggesting that the scanners didn’t have enough memory to store the database of barcodes. As the discussion progressed, Petito would not describe what system NYPD believes would effectively allow traffic agents to determine the validity of a placard, claiming that explaining the current features in public would compromise their security. NYPD wouldn’t object to legislation that allowed the police commissioner to determine what security features he felt were necessary — the status quo, in other words. Several times, Petito displayed a failure to understand the basic intent of Garodnick’s legislation. When she argued that there wouldn’t be a barcode on the fake Numismatic Agency placard anyway, Garodnick tried to explain that was the point. “We do not issue placards to them,” Petito still maintained. When I spoke to James Huntley, the president of the traffic enforcement agents’ union, he said his members do indeed give out parking tickets to cars with obviously fake placards and only call in Internal Affairs for cases where the placard seems to be a fraudulent reproduction or imitation of an official NYPD placard. If Huntley is right, it would be another indication that Petito did not understand that placard abuse goes far beyond the abuse of official placards. The special placard division of Internal Affairs has issued 29,885 summons and towed 6,484 cars using improper placards, in addition to roughly 100 more serious actions, since April 2008, said Petito. With a dozen officers working in the placard division, that only works out to about two and a half placard abusers caught by each Internal Affairs officer each day. In contrast, Transportation Alternatives volunteers found 330 fake or illegally-used placards in just one day in Downtown Brooklyn last January. Jonathan Kalkin, who has served as the chair of the Roosevelt Island Operating Corporation Operations Committee, suggested that the city “make citizens able to scan, get that information and then upload it as a complaint to 311.” Combining some sort of technological solution with crowdsourcing would “stop police officers from worrying about protecting their own,” he argued. Six other parking bills were up for discussion at the hearing, all of which made it easier to park or to pay or contest a parking ticket. The most far-reaching was sponsored by Transportation Committee Chair James Vacca. His legislation would require that traffic enforcement agents affix photographs to parking tickets for certain violations as additional evidence. NYPD opposed the bill on the grounds that it would imply that the sworn statement of the agent is not good enough to find someone guilty of a parking violation. Transportation Alternatives’s staffer responsible for creating and utilizing the false placard should be arrested for violating the applicable statutes pertaining to falsifying placards. You should be arrested for missing the point. There’s nothing illegal or “fake” (or illegal) about the Numismatic Society placard – it’s just a piece of paper with some words and graphics on it. It doesn’t purport to have been issued by any placard-issuing agency; or even claim to offer any parking privileges. There’s no law against having a document in your windshield; and it’s the fault of the parking agents for not enforcing on these placards. There’s nothing to be done about those placards, and that same TA study you mentioned indicated that just about 2% (31 of 1450 observed placards) of placards were of the fake variety that may have been identified using barcode identification. Exactly what law was broken here? That’s not a parking placard. That piece of paper says nothing about parking. It says nothing about NYPD or DOT or any agency authorized to issue placards. Guest (Oh Nameless One) — Since when is it illegal to prove that the NYPD is simply not doing its job when it comes to parking (and moving violation for that matter) enforcement? Bonus points to you if you know what Numismatic means. It means the study of money…because that’s really what this comes down to — the millions of dollars of wasted revenue for the City because the NYPD doesn’t properly enforce placards. Are there any penalties for perjury when testifying to the City Council? “They will look at a permit and if it looks legitimate, they will not issue the ticket.” That’s not true, or at least it’s a lie of omission. They have been directly observed looking at placards that were clearly illegitimate (this Numismatic placard, expired NYPD placards, which are a different color, etc.) and not issuing the ticket. She suggested they ticket vehicles with NYPD placards parked at hydrants? Really? The NYPD apparently can’t even keep its lies straight! Previously they’ve been saying that TEAs do not issue tickets to cops, but they are supposed to call it in to their supervisor. Of course, that falsehood has been documented time and time again as well. It is a sorry state of affairs when top-ranking officials of the NYPD have the audacity to tell such bald-faced lies to our elected officials. She should be held accountable. Otherwise, it’s a farce to call New York a democracy. Er, that’s pure truth: If an agent looks at a permit and it looks legitimate, the won’t issue a ticket. That’s how the system is intended to work. What they do when permit does not look legitimate was not part of her statement. parking violation.” The whole system works because the cops are always right because they’re cops and cops are always right. Anything contradicting this tautology is wrong. QED. We have to keep up the pressure on this just like all the forms of corruption trying to enter governmental affairs like water on the hull of ship. Many other motor vehicle laws are loosely enforced including idling more than 3 minutes, noisy bikes, tinted glass over 20% in front windows (especially on official vehicles), visual obstuctions like CDs, fullzy dice and GPS in the widshield, obscured license plates. All of these things are plainly visible and immediately enforceable. I would gladly pay a parking ticket or two for being 2 feet to close to a hydrant if it would mean that stricter enforcement applied to everyone equally and eliminated these things that jeopardize safety and enhance motorist sense of entitlement to superiority on the road. Almost all major cities around the world have an easy way of avoiding this problem. There are zero official car parking privileges. Voila! Problem solved. It has been very hard for them to deal with the fact there are more cameras around, and they can’t get away with telling whatever story they want anymore. @0f75a479cd466bb514768d794efb8dd7:disqus do you really think that with a transcript, her comments really stayed within the bounds of not telling the complete truth? The fire hydrants statement was clearly a lie, as I am sure were many other statements. You should not give our law enforcement officials a free pass for deliberately misleading our elected representatives. Hear, hear! Why should any private vehicle get a placard? If your need for a car is so important, you merit using an official vehicle (i.e. gov’t plates). I have trouble imagining that there are 78,000 individuals in this city who are so important that their private vehicles merit the right to park anywhere they want. Let them use the subway like the rest of us. Are you saying this is ethical, or just not quite illegal? Are you suggesting it’s not illegal to conspire with the NYPD to defraud the City of millions of dollars in annual revenue? This is a full-blown criminal enterprise, and the sooner the Feds start dragging away dirty cops, politicians, and jerks who have been abusing our streets, the better! I just checked the legislature website, and this bill has 26 sponsors out of 51 seats on the council, so it looks pretty likely to pass. Also, I imagine “The Truth” and “Guest” are both police officers who don’t want to lose the ability to illegally park wherever they want. Sad days these are, when even the police may have to follow the law. What are you talking about? Can’t bother to read much, can you? My mistake, @40daebbed12b53745f7f9f21456e6154:disqus . I apologize, and I’ve amended my comment accordingly. If for some reason they have to have placards, they should have a centralized authority in the city charged with dispensing them, based on a closed list of privileges (police, fire department, and so on). The placards should be stamped with an official seal, and the city should then pass laws making it illegal to use the seal without authorization, in the same manner that certain symbols, such as the Red Cross, are protected. All of this is straightforward and would cut down on the abuse. Almost certainly, this won’t be done because then it would invite an open discussion of who should have placard privileges and why. And it would take away the power of the cops to do whatever they want, whenever they want, without being questioned by anybody. No @05aff3c0a7c94529dc138ce87543764a:disqus , they can’t be wrong, because they’re the cops. If somebody challenges them on anything, they’re obviously an EDP or an animal who just doesn’t understand professional courtesy. It would clearly be within their discretion to arrest anybody who questioned them for disturbing the peace. Remember, you’re only innocent so long as you don’t question the cops! NYPD, as well as some other public svc agencies, were promised parking priveleges as part of a previous round of labor negotiations. The city can not or will not provide the promised parking via off-street lots or garages. Placards then become a substitute, albeit ilegal, to take the parking benefits that members of these unions belive they are entitled to. That is how it starts, and then spreads through a culture of corruption to more blatant mis-use. While I think the parking practices of most public sector employees, especially NYPD, are reprehensible, we must also ascribe some blame to the city administration for agreeing to a parking benefit in the first place, and then failing to adequately provide it. NYPD to Council: Leave Our Parking Placards Alone! Police officials returned to the city council transportation committee with the same tired talking points. And Corey Johnson is not happy.